SFI Readerlink Dist, 9780794442989, 12pp. 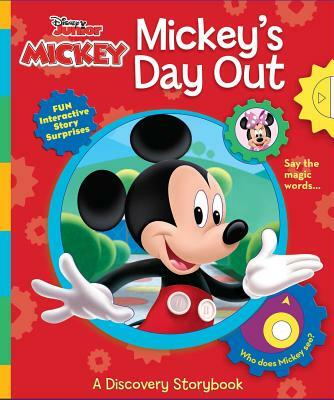 Play and read alongside Mickey Mouse in this interactive book full of sliding tabs, wheels, and lift-the-flaps! It’s another busy, fun-filled day at the Mickey Mouse Clubhouse and you’re invited to join the party! Young Mickey fans will find tons of fun and loads of learning activities in this unique interactive book. Lift the flaps and pull the sliding panels to reveal hidden animals and objects, turn the wheels to create changing pictures, and more. Explore the magical world of Mickey Mouse Clubhouse and discover a delightful world of fun and learning. Susan Amerikaner is a writer, educator and specialist in children’s media. With a Master’s in Education from George Washington University, she has taught grades K-6, specializing in developing curricula for gifted children. Ms. Amerikaner is a writer and consultant for companies including Disney and Random House. In addition to more than 100 published books, Ms. Amerikaner has received the Writer’s Guild Award for Outstanding Children’s Script and an Emmy nomination for her TV scripts. Ms. Amerikaner considers herself very fortunate to work each day doing what comes naturally to her--thinking like a child.